It permeates everything . . .
Our walk, our talk, our attitude, our witness, our generosity (or lack thereof), our direction in life. I am the greatest. Not only do I knock em out, I pick the round! It ain’t bragging if you can do it. I would not talk so much about myself if there were anybody else whom I knew as well. There are two sides to every question: my side and the wrong side. If you believe in yourself and have dedication and pride – and never quit, you’ll be a winner. The price of victory is high but so are the rewards. I love what I do. I take great pride in what I do. And I can’t do something halfway, three-quarters, nine-tenths. If I’m going to do something, I go all the way. That’s what Rocky is all about: pride, reputation, and not being another bum in the neighborhood. Let’s stand up. Let’s speak with pride about our morals and our values and redouble our effort to elect more conservative Republicans. I obviously take a lot of pride in what I do on the football field, because that has the ability to influence a lot of people. That puts smiles on people’s faces. That gives people a pep in their step on Monday morning when they go back to work. One disco, one soft ball game, one lost love, one gay pride rally at a time. I take pride in being one of the most successful producers in hip-hop history, having the most successful record in hip-hop history, I have the most number ones. The fact that I’m very close with my past relationships is something I pride myself on. My mom is still close to her first husband. It’s nice to be able to enjoy someone in a different form. 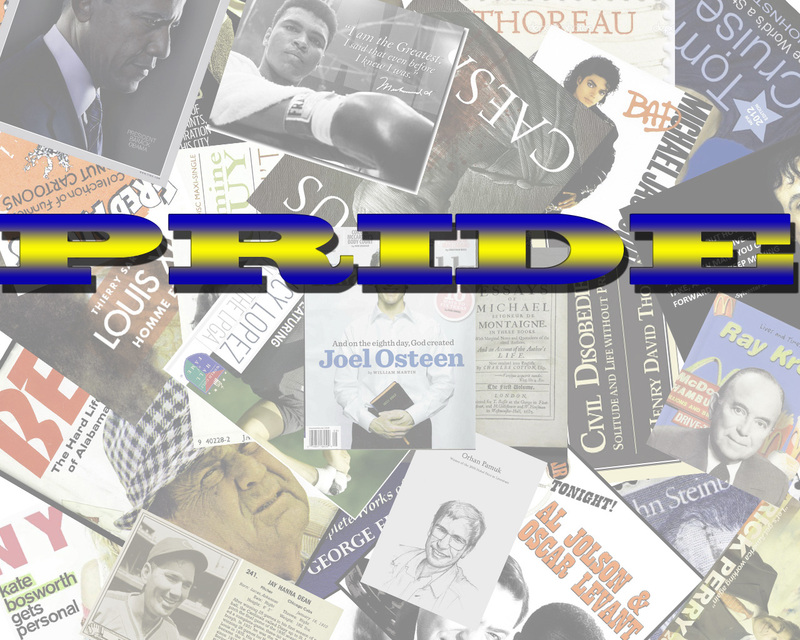 These are famous people throughout history defining what pride is by using it in relation to themselves – how they view pride. Are these statements accurate? 4 then I will provide the rain you need in its season, the land will yield its produce, and the trees in the field will yield their fruit. then I will discipline you seven times over for your sins. 19 I will break the pride you have in your own power. All the nations whom Yahweh raises up and shows favor to—Egypt, Assyria, Babylon—will come to the same end; Israel not withstanding. in terms of their relationship with Yahweh. Gāʾāh is used most often to refer to human pride. In Ezek. 16:49 such pride is called sin. Ezekiel 16:49 (CJB) 49 The crimes of your sister S’dom were pride and gluttony; she and her daughters were careless and complacent, so that they did nothing to help the poor and needy. Judah’s smug affluence and indifference resulted in arrogance. Although Israel’s arrogance is a testimony against itself, there is no inclination to change (Hos. 7:10). Hosea 7:10 (CJB) 10 The pride of Isra’el testifies in his face, but in spite of all this they haven’t returned to Adonai their God or sought him. Pride on both the national and individual levels leads to destruction. In history nations and civilizations have fallen due to pride. On the individual level, the righteous find it better to identify with the lowly and oppressed than to identify with the proud. Ultimately, the posture of pride is not simply disregard for God, but defiance. This is expressed in the mistreatment of the righteous. If pride contains the seeds of its own downfall (Prov. 16:18), this constitutes only a part of the equation. Proverbs 16:18 (CJB) 18 Pride goes before destruction, and arrogance before failure. God himself takes an active role in the matter. Yahweh proclaimed, “This is what they will get in return for their pride” (Zeph. 2:10). Zephaniah 2:10 (CJB) 10 This is what they will earn for their pride, for having reviled and boasted against the people of Adonai-Tzva’ot. Thoralf Gilbrant, ed., “1377,” in The Complete Biblical Library Hebrew-English Dictionary – Gimel-Zayin, (Springfield, IL: World Library Press, Inc., 1998), WORDsearch CROSS e-book, Under: “1377”. This is quite a contrast to the quotes by writers, stars and rulers that we read above, isn’t it? The root of the Hebrew word ‏ָגּאוֹן‎ gāʾôn is ‏ָגּאָה‎ gāʾāh. It means: to be high – to increase – to be majestic. This is important to understand when looking at pride because pride attempts to do all of these things. 2 First comes pride, then disgrace; but with the humble is wisdom. Zādhôn is a masculine noun derived from the verb zîdh, “to behave insolently” or “to be presumptuous” (HED #2202). It is primarily used in contexts which describe people whose pride causes them to oppose God and exalt themselves. It can be used to describe insolence or presumption toward humans. David’s brother Eliab accused him of insolence before the contest with Goliath (1 Sam. 17:28). It may be displayed by refusing to listen to the priest (Deut. 17:12) or by setting oneself up as a prophet and making false predictions (Deut. 18:22). Jeremiah 49:16 used it to describe the arrogance of Edom (also documented in the Book of Obadiah). In Jer. 50:31f, he brings the same charge against Babylon. Whether the subject of this pride is an individual or a nation, the point is that the insolence stems from a lack of recognition of God and of one’s lesser status compared to Him. Those who prophesy falsely are usurping the role of God by speaking for Him. The meaning is difficult to determine in Ezek. 7:10: “Your doom has gone forth; the rod has budded, arrogance has blossomed” (NASB). The verse seems to refer to Israel (who deserves judgment), but some take the term to refer to Babylon (as the instrument of judgment). Thoralf Gilbrant, ed., “2171,” in The Complete Biblical Library Hebrew-English Dictionary – Gimel-Zayin, (Springfield, IL: World Library Press, Inc., 1998), WORDsearch CROSS e-book, Under: “2171”. The Creator God is truth – there is no lie in him. What would cause Eve to pick the lie from the inventor of the lie over the truth? PRIDE! The ultimate exaltation – to make oneself like the Most High. Man fell as a result of believing this lie – of wanting to believe this lie. This was opposing God and exalting self. This was defiance. This was pride! Ironically, this exaltation – this pride, was the Adversary’s downfall as well. In our next post, we will learn and go a little deeper into to pride – we will examine the ramifications of pride – we will look at its implications from a worldly standpoint vs a Godly one. We will examine how it permeates our entire lives – much of the time without us even aware of it. It shouldn’t be too much of a shocker that it does – After all, if it was what the Adversary used to lure Eve to believe the lie over the truth . . . and it worked . . . if it was the downfall of the Adversary himself, why would we expect it not to be his weapon of choice against all of mankind? This entry was posted in Word Studies and tagged adversary, B'chukkotai, By my regulations, defiance, exhalt, gāʾôn, Parashah 33, pride, You will be like God, zādhôn. Bookmark the permalink. Wow…….what a great way to start my day (reading this). So many places I want to “highlight”. I will “ponder” on this all day and re read it tonight……just to check myself. Thanks for sharing. Hopefully the next few posts will be just as impactful! Thanks!